This property is located in Waterville, a village in County Kerry, Ireland. 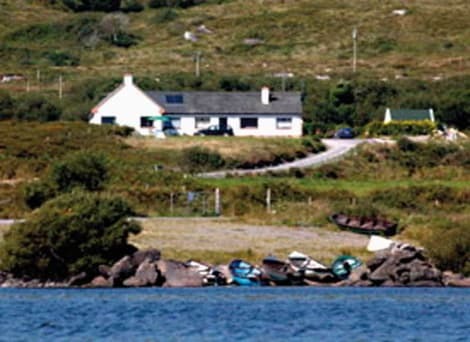 Guests will find themselves close to a host of tourist attractions such as Daniel O'Connell Museum, the National Park at Derrynane and Skelling Michael Island. Ideal for nature and lovers sports, this hotel boasts a unique location ideal for visitors to enjoy an inspiring walk through the beautiful trails or a range of water sports such as sailing or diving. It provides a choice of spacious en suite rooms featuring a host of modern conveniences to guarantee a truly memorable stay. They all have been decorated in soothing tones to create a warm atmosphere in which travellers feel comfortable from the first moment. A wide range of teas, coffees and herbal teas are also available at breakfast every day. With wonderful panoramas of the wild Atlantic, Clifford’s Ocean View is nestled in a quiet seafront location. Welcoming guests since 1991, it’s an ideal base for those looking to tour the Ring of Kerry and County Kerry’s breathtaking walks and trails. Host Abbie Clifford gladly arranges fishing trips, tours of the historic Skellig Islands and shares her extensive local knowledge of tourist attractions. Within walking distance of Waterville’s lively pubs and restaurants, guests are also just minutes from two renowned golf courses and an array of outdoor pursuits. At The Smugglers Inn, enjoy a satisfying meal at the restaurant. Wrap up your day with a drink at the bar/lounge. A complimentary full breakfast is included. lastminute.com has a fantastic range of hotels in Waterville, with everything from cheap hotels to luxurious five star accommodation available. We like to live up to our last minute name so remember you can book any one of our excellent Waterville hotels up until midnight and stay the same night.